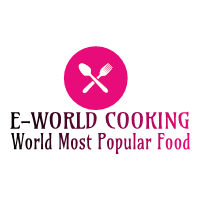 French Fries Recipe | Perfect French Fries Recipe ~ E-World Cooking-The World Most Popular Food. Chat masala for the sprinkle. Today we are making most relished and tempting French fries. We often have these in restaurants but you can very easily make them at our home. Let’s start with the procedure of making French fries. Start with pilling and cutting the potatoes for making French fries. We have taken four big size potatoes. Drench the peeled potatoes in water. We have thoroughly rinsed the potatoes but always drench the peeled potatoes in water else they will trunk black. Drench them in water. Heat some water for boiling these chunks. For this, take some water in a vessel and turn on the flame and Add 1 Tsp. salt to the water; Let it simmer for a while. Cover the vessel so that it boils immediately. When you see gentle boil in the water, drop the French fries into it. The boil in water will settle down after dropping the French fries to it but the water is still hot and the flame is kept high. Cover again and let it simmer for 5 Minutes. Just make them little tender and soft, After 5 minutes check the fries and make sure that they get little tender. Press them a little with your nails to check if they turned soft. Then turn off the flame and drain them out from water in a colander. Now spread them over a cloth and dry them up, wipe them thoroughly with the cloth. Transfer the French fries to a plate and place them in the freezer so that they cool down completely, this helps in making crispy French fries now place them in a freezer for up to an hour to set and then fry. The French fries have turned little crispy and stiff now let us fry them. Heat vegetable oil in the deep pan, when the oil is hot then drop the French fries in oil to deep fry. So place as many fries as possible in the work at once time and fry on high flame till they get a little brown. Drain out the French fries. We just need to fry them a little for now and will make them a crispy letter. Hold the ladle like this so that excess oil drains back to the work. Drain out all the French fries and similarly fry the rest as well. Let’s the French fries cool down under fan for 15 to 20 minutes. After the French fries have cooled down and now we will refry them till crispy. Again Heat vegetable oil in the deep pan Then drop as many fries as possible in the wok at one time and fry till they get golden brown. Keep the flame high. Drain out the fries golden brown French fries in a sieve to remove extra oil in the bowl kept below. Similarly fry rest of the French fries as well. Now oil passed through the sieve in the bowl No oil passed through the sieve in the bowl. 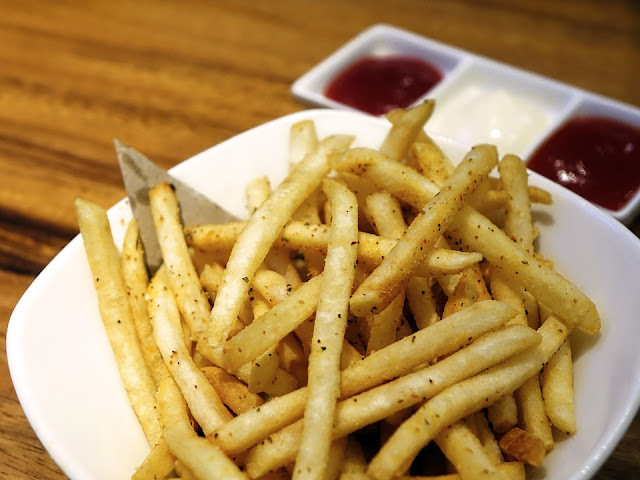 Mouth drooling and crispy French fries are ready. We fried the fries till golden brown. Sprinkle some chaat masala over the French fries and mix well. 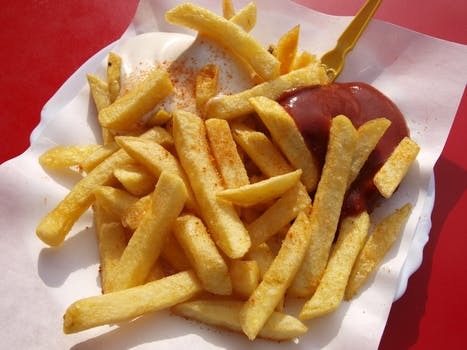 Serving these tempting French fries with tomato ketchup or any other Chutney as desired.